Colder weather is in the forecast as we head toward the end of the week. 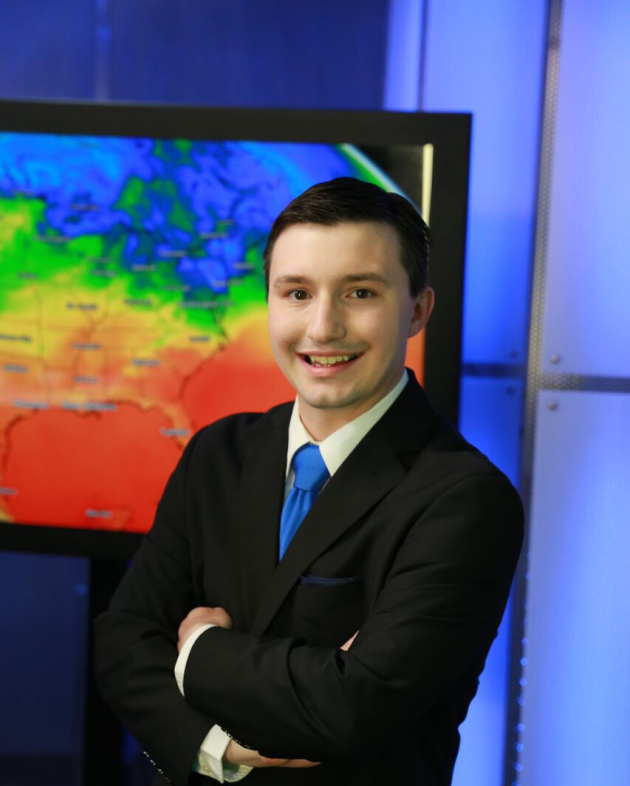 So I figured I’d take a look at the coldest highs we’ve seen so far this winter... and the last time we saw certain bitter cold temperatures across the region. 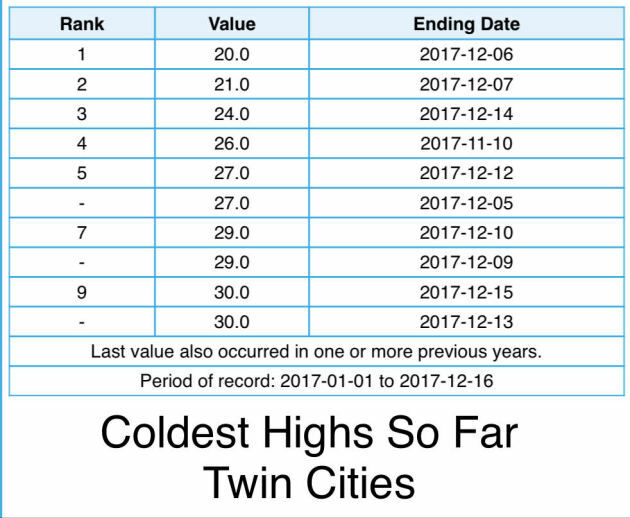 The coldest high we’ve seen so far this winter in the Twin Cities is 20, set on December 6th. Meanwhile, the coldest low so far this winter has been 6, set on December 12th. 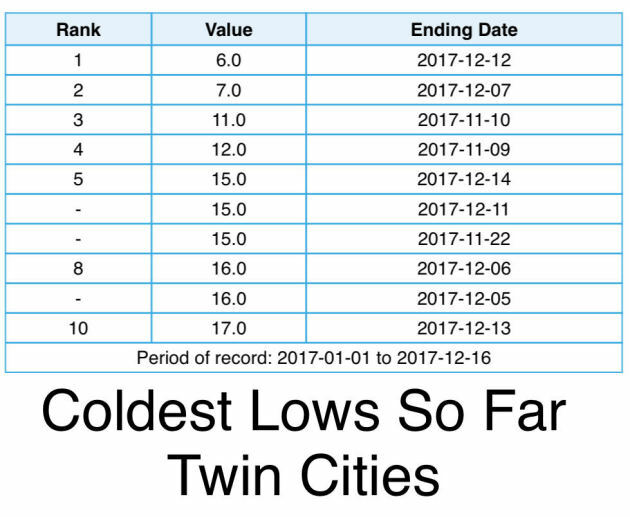 Here’s a list of last times with certain highs or lows in the Twin Cities. The last time we saw a high of 10 or below and a subzero low was on January 13th of this year. The last time we saw a low of -10 or below was this time last December. 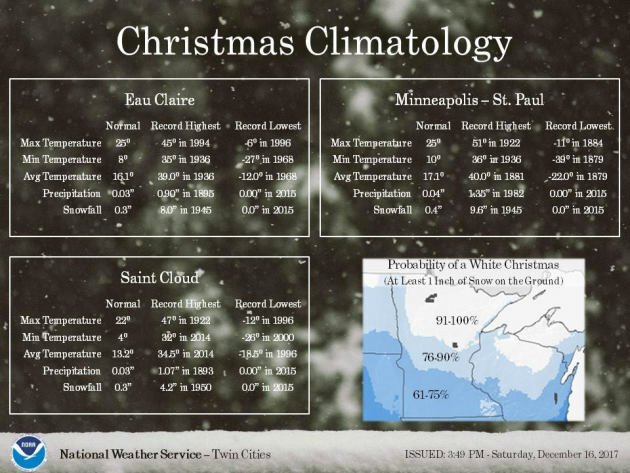 With Christmas a week away, here’s a look at records across southern Minnesota into western Wisconsin for Christmas Day, courtesy of the Twin Cities NWS Office. We’ll have to keep an eye on the coldest high records, as it looks like we’ll see bitterly cold highs by early next week. Could they approach these records? More on that in a moment! What happens in the Arctic doesn't necessarily stay in the Arctic. Far northern latitudes are warming much faster than any spot on the planet. This may be creating a wavier, "high amplitude" jet stream pattern over the Northern Hemisphere, with weather systems moving slower - more prone to stalling. That's what happened 4 winters ago, when "Polar Vortex" became part of our lexicon. Frigid air stalled for the better part of 3 months, creating a rare pioneer winter for Minnesota. 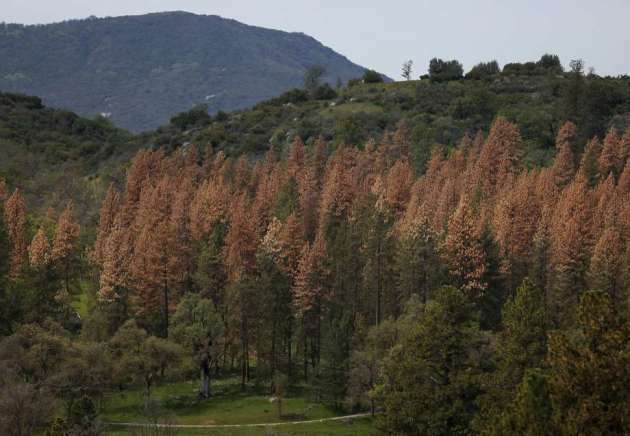 Sluggish steering winds may be contributing to record drought and wildfires in California too. The patterns are changing - it's probably not your imagination. 40F will feel amazingly good today; relative warmth lingering into midweek. Light snow streaks in on Wednesday with a few inches possible Thursday into Friday morning. Not a big surprise. Polar air is often preceded by fresh bursts of snow. Single digit highs are likely from Christmas Eve into next week, with as many as 7 nights below zero. Models show moderation in time for New Year's, but next week may take your breath away. Literally. MONDAY: Breezy and milder. High 40. Low 28. Chance of precipitation 20%. Wind SW 10-20 mph. TUESDAY: Partly sunny, still quite pleasant. High 36. Low 19. Chance of precipitation 10%. Wind NW 8-13 mph. WEDNESDAY: Light snow, couple inches up north? High 27. Low 25. 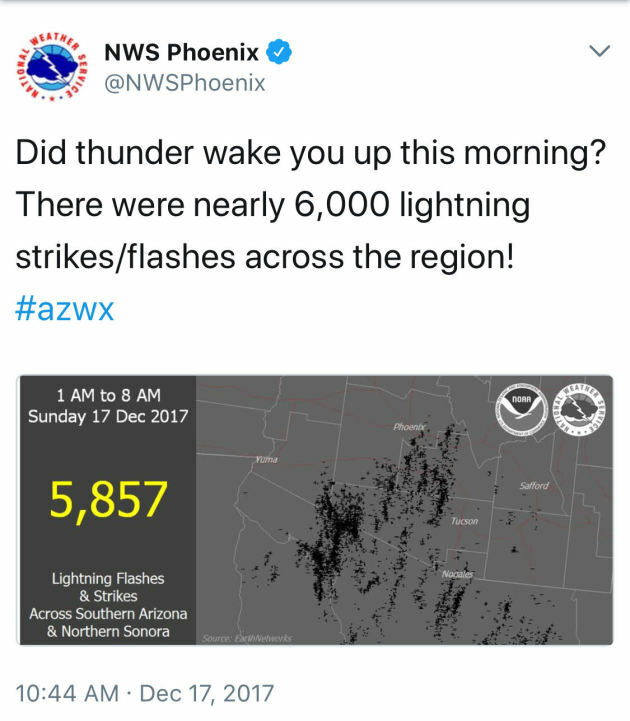 Chance of precipitation 50%. Wind E 8-13 mph. THURSDAY: More snow, few inches possible. High 29. Low 21. Chance of precipitation 80%. Wind NE 10-15 mph. FRIDAY: Snow tapers, roads still slick. High 24. Low 8. Chance of precipitation 70%. Wind NW 8-13 mph. SATURDAY: Few flurries, feels like 0F. High 13. Low -6. Chance of precipitation 30%. Wind NW 8-13 mph. SUNDAY: Frostbite risk for Santa. Plenty cold. High 8. Low -3. Chance of precipitation 20%. Wind N 5-10 mph. 1923: Southern Minnesota experiences a 'heat wave'. Temperatures rose into the 60s at New Ulm and St. Peter. 1917: Milaca has its fifty-ninth consecutive day with no precipitation. 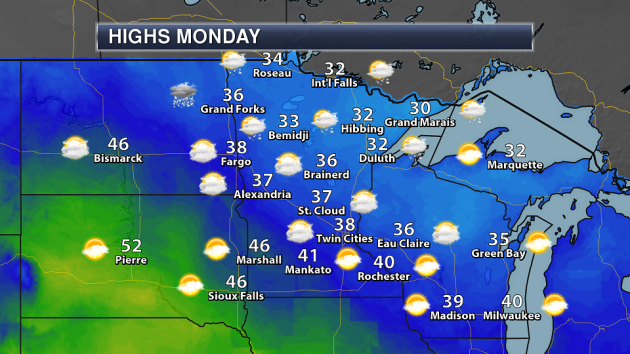 Highs will climb into the 30s across the state Monday, with the thermometer reaching into the 40s across southern Minnesota where there is little (if any) snow on the ground in spots. Random stat: Duluth has had a high at/above freezing 18% of the time on December 18th. 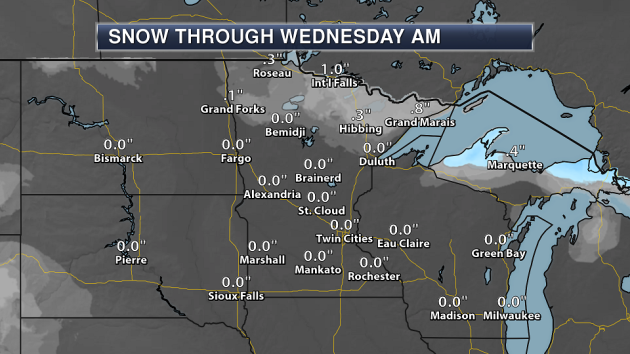 Some light snow will be possible across northern Minnesota - more on potential totals from that in a moment. 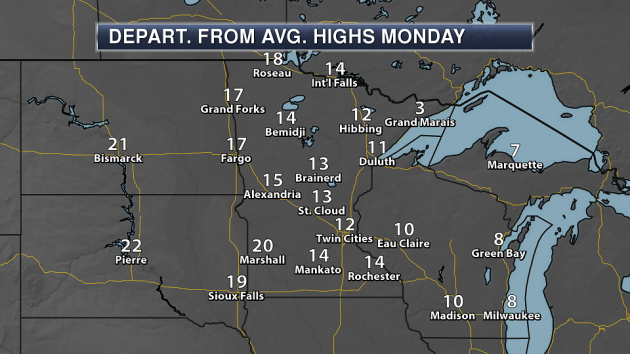 Highs will be above average across the state Monday, with most spots 10-20 degrees above average. Snow totals will be light - mainly under an inch - across northern Minnesota Monday due to a cold front moving across the region. 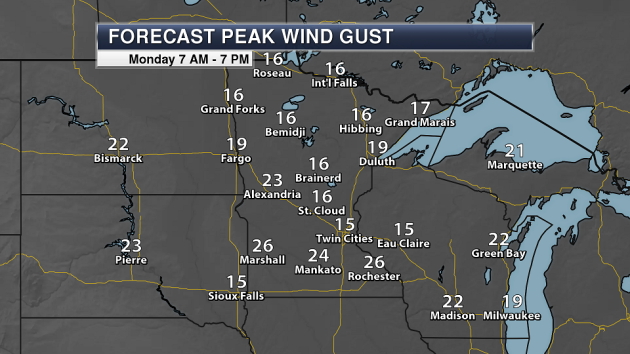 Winds will be a little gusty at times Monday, with peak wind gusts in the teens and 20s across the state. We’ll see strong wind gusts Tuesday as well, with peak gusts in the 20 and 30 mph range across Minnesota. Canada just called - they’re sending a bunch of cold air south to end the week. Get your coats and warm drinks ready now! We’ll see gradually colder temperatures each day from Thursday into early next week. I’ll show you highs for late in the week in a moment. We will see warmer temperatures return, though, toward the middle to end of next week. Before the cold filters in, it looks like we’ll get a chance of accumulating snow across the region. Right now the best chance of accumulating snow will be from Wednesday into Thursday, and totals could be at least a few inches. I’m leaving it at a generic “few inches” at the moment as it’s too early to say exactly how much snow could fall. There is still considerable differences in the models this far out, however model trends do show this system at least having some impact on the Twin Cities at this moment. 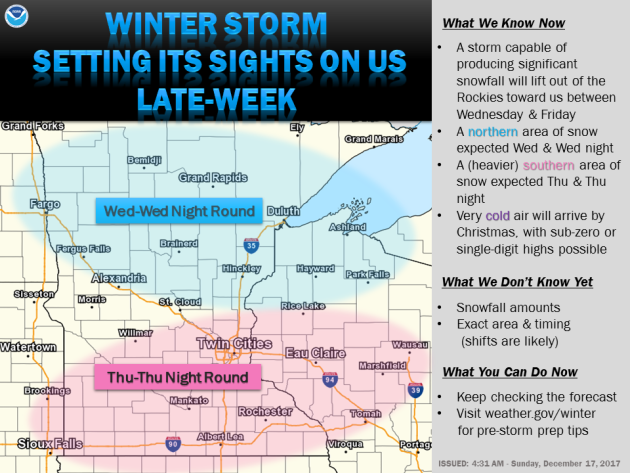 Here’s the latest thinking from the Twin Cities National Weather Service. A band of snow looks to set up over parts of northern and central Minnesota Wednesday into Wednesday Night, with a second one across southern Minnesota into Thursday. And again, here comes the cold after the snow. 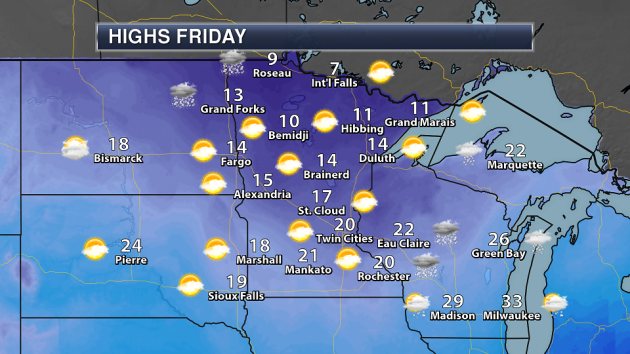 Highs across northern Minnesota Friday won’t make it out of the single digits, meanwhile they’ll attempt to make 20 in the Twin Cities. 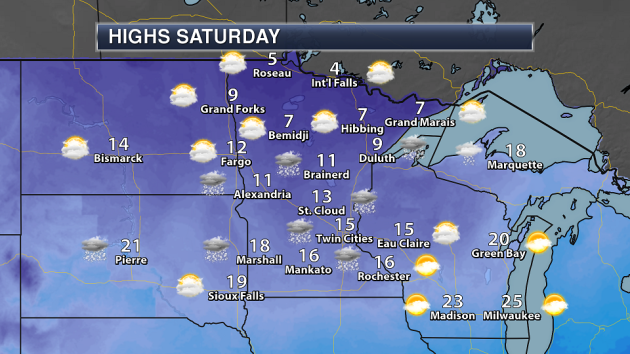 Saturday will see highs in the single digits and teens across southern Minnesota - certainly the coldest we have been so far this season. 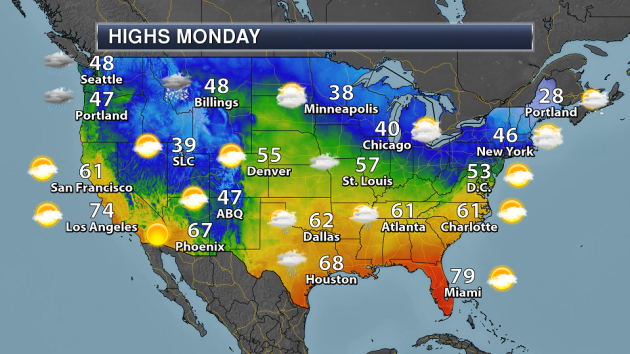 A cold front will stall out across the Northwest Monday, bringing rain and snow to the region. A frontal system will remain across the western and northern Gulf Coast, bringing the potential of showers and storms. In the Northeast, a disturbance will bring the potential of rain and snow to parts of the region. Another frontal system will bring a few snow showers across northern North Dakota, northern Minnesota and into the upper Great Lakes. 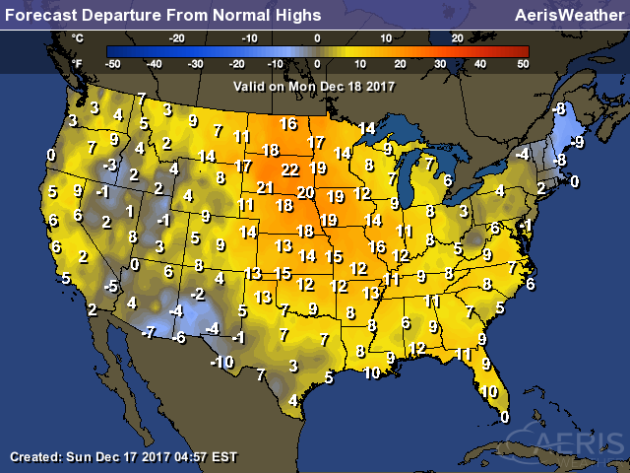 Most of the nation will see temperatures that are above average for the middle of December, with the greatest departures from average expected across the central United States. Two particular areas of the nation will see heavy rain through Friday morning. One is across the South Central and Southeastern portions of the country, where a few rounds of precipitation are possible. We might have to watch for flooding, as some areas could see 3-6” through the end of the week. This looks like it’ll all be in the form of rain. Across the Northwest, rounds of rain and snow is expected through the middle of the week. Plowable Possibilities Thursday - Coldest Christmas Since 1996?